Any comments, Monsanto? I’d be happy to pass them along to Michael Hansen. This entry was posted on 23 January, 2014 in homepage and tagged 3 million Euro study, Bio-terrorism, Consumers Union, European Commission, Gilles-Eric Seralini, GMO testing on rats, Jon Rappoport, Michael Hansen, Monsanto Roundup Ready, rat tumours, Sprague-Dawley strain, Steve Cunwood. Bookmark the permalink. In this long battle its worth drawing attention to the case around 1999/2000 when Monsanto tried to get their Chardon-LL GMO seed onto the market in the UK, the first of its kind. Friends of the Earth and many other organisations (including the GMO Campaign which I was involved with at the time) took them to court – the hearings being held over three days in a London hotel with the intention to continue at a hotel in Manchester for a further three days following this. The evidence and letters of protest against them from farmers, individuals and organisations filled an entire room. Various speakers took part on behalf of the GMO Campaign: the organic farmer Julian Rose, scientist Angela Ryan, Dr Mae Wan Ho and the Biochemist Dr Arpad Pusztai. Dr Pusztai famously was the only person in the world at that time chosen to do tests on GMO-fed rats by the Blair Government, who suddenly stopped his experimental work when his results were found to be detrimental to the livers of the rats. His shocking and irrefutable evidence during the second dramatic day of the trial caused Monsanto to drop the case and it proceeded no further. 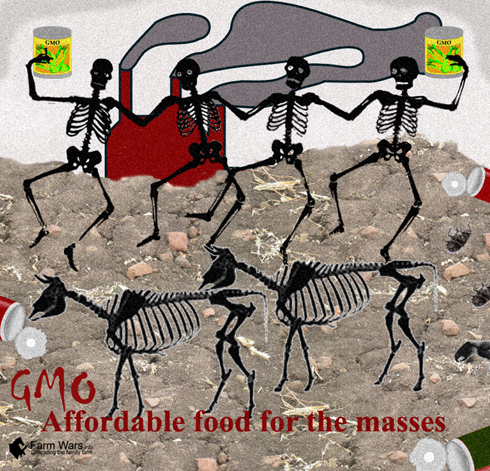 But theyre still at it, hoping to get vitamin-enriched GMO plants into the UK in the coming months. Many of the deficiencies this new wonder product claims to overcome may not occur in the first place if nature was allowed to provide in abundance, untampered with, as it has done for millennia. Natural organic farming, going with the flow of nature will provide all our vitamins for our every health need, plus the prevention and cure of illness: not a laboratory inventing strange hybrids to supplement crops and soil battered and poisoned by chemicals, and a system of unnatural and cruel meat over-production and consumption, all of which are unsustainable. All Monsanto are doing is providing a self-serving, profitable solution to unnecessary problems created by multi-nationals in the first place.